Tires - International Forklift Co. Select the solution that’s right for your needs, and you get custom-made service at the best price per working hour. Our offer includes a timely response, fleet analysis, high-quality tire products and experienced technicians. 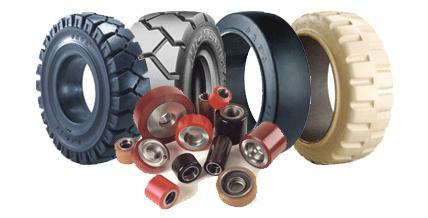 And since we have the largest customer base in the industry, we’re familiar with all types of industrial tire use. Forklift tire mobile fitting, our core service, with best-in- class performance tires specifically selected to outfit your customized fleet at the guaranteed lowest operating cost. Service level is personalized according to your fleet analysis and business needs. Driving a forklift with worn out tires is dangerous, so here are some signs to look for that will let you know that you should replace the tires as soon as possible. Take a look at the 50% wear line that is marked just above the tire size. If the top of the tire now meets the wear line, it is time to replace the tires. Examine the surface of the tire. Have pieces of rubber started to fall off? This can be caused by debris and litter on the floor or by the forklift driving over rough surfaces. If chunks of rubber have fallen off the tires, this can cause the forklift to rattle and become unstable when you are driving it. You might also notice tears in the surface of the tires, which is caused by debris on the floor of your workspace or by running the forklift over sharp machinery edges. If you see these, you should also replace the tires. Another sign to look out for are flat spots, which occur when the forklift tires are spun during acceleration or when it performs frequent sharp turns under heavy loads. This can cause the truck to start shaking when it moves. You should also watch out for tires that are under inflated or over inflated, as this can compromise their stability or accelerate the wear. Over inflated tires are more difficult to stop and under inflated tires make it challenging to turn the vehicle. Also, you should keep an eye on the wear of the tire tread. If the tires have started to become bald, this is a sign that they need to be replaced. Reduced tire traction, which can affect warehouse safety. Increased fuel consumption due to tire resistance. Tire hardness can influence shock resistance which can affect future maintenance costs and worker downtime. Damaged tires can cause tipping hazards when under load ot cornering sharply. New tires will increase stopping distances. Bad tires cause serious stress to the frame, axels, ad drive train leading to costly equipment breakdowns. These major costs can be avoided if tires are changed at the proper service intervals.